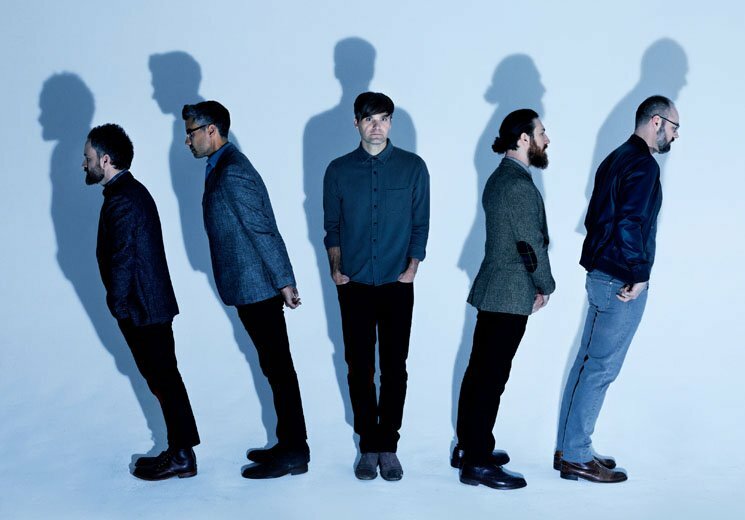 Death Cab for Cutie are embarking on a new chapter. Over 20 years into their career, the group are now a five-piece, following the departure of founding member Chris Walla in 2014. The two newest members, guitarist Dave Depper and keyboardist Zac Rae, are "extraordinarily instrumental and important of how this album ended up sounding the way that it did," bassist Nick Harmer tells Exclaim!, referring to the band's ninth studio album, Thank You for Today. Produced by Rich Costey, who also worked with the band on 2015's Kintsugi, the album is a focused and cohesive group of songs that expand on the long-lasting strengths of Ben Gibbard's songwriting. After touring with Depper and Rae in the support of Kintsugi, Harmer says the band was left with a "a big question mark hanging over [their] heads as to how [making a new record] was exactly gonna work out. "It's one thing to feel like it's gonna be a really constructive and positive experience," Harmer continues. "It's another thing to sort of get two months into making a record, and everyone's kind of lost in the woods, we're not really sure how things are going." Anxieties melted away once the band got to work. "The big difference was just [Depper and Rae's] level of excitement and enthusiasm in the studio for when we were developing the songs: for coming up with ideas, suggesting textures and countermelodies to really supplement and bolster a lot of the demo work that Ben had done," Harmer enthuses. He compares the experience to the recording of Kintsugi, when the band knew that Walla was leaving, which created "a spectre hanging around the room." With Depper and Rae, Harmer appreciated the "all for one, one for all feeling in the studio" — the band's shared vision forming a "unified connection and expressiveness," rather than the "compartmentalization" present during the making of their past two albums. Harmer explains that Gibbard takes a studious approach to his songwriting: he goes to "an office space every day and [writes]," similar to the methods of Nick Cave. Gibbard provided the band with over 30 demos to consider for Thank You for Today, which the members used as guidelines for their individual writing. Coming together to work through the songs is where "it's about everyone reading each others' diaries, almost," he laughs. This time around, Gibbard honed in on what Harmer refers to as his ability to write about "small moments, but those small moments become much bigger than that, and connect on a much more universal and larger scale when you kind of step back a little bit from them." Change became the unintentional theme of the album's songs, encapsulated in tracks such as, "You Moved Away," about a local friend and artist who had left Seattle for Chicago, and "Gold Rush," the record's multifaceted lead single. "I think on one passive listen [to 'Gold Rush'], it is about gentrification, I suppose, and the change in a city," comments Harmer. "But [there are] also some really personal lines in there about having to be careful about where you store your memories and what you become attached to, and how time marches on and things change, and it's almost more destructive to expect things not to change and get upset when it does, than it is to sort of allow yourself to be more flexible." Thank You for Today's songs have multiple layers, with highly visual lyrics that attune the listener to detail. Harmer speaks of it as, "where Ben's writing about a smaller, personal moment that means something specific to him, but it means something totally different for me, and I find just as much connection and emotional weight in it. "Ben is the one who gives us the roadmap and gives us the parameters to collaborate within," asserts Harmer. "I don't think we'd be very successful at it if I showed up and I'm like, 'Guys, I just wrote a bass riff! I don't know anything else about this song but I've got this bass riff — let's write a song around it!'" Despite the prominence of Gibbard's guidance, Harmer expresses excitement about the band as a unit and the importance of each member's contribution. "From the very beginning, we were like, 'Let's only put the songs on this album that we all 100 percent love.' No reservations about anything — and that's where it ended up. We're very proud of that." Thank You for Today is out August 17 via Atlantic Records. You can listen to it here.